camera to shows (depending on the anticipated mosh levels.. haha)! As an experienced concert go-er, I can usually anticipate the intensity level of the crowd depending on the type of music or the level of fame the artist has achieved.. This was not the case for Marina and The Diamonds! Having had success and a dedicated following in the UK music biz, her status in the US is definitely more on the “up and coming” side of the spectrum. With that being said, Marina and her Diamonds were able to sell out the Showbox Sodo on the first stop of her last “Lonely Hearts Club” tour in Seattle! After the opening set, my concert going buddy and I (shout-outs to Mo-riss), were beginning to get restless in all the anticipation for Marina to start, and we began scouting out the crowd… For future reference, the crowd at a Marina show might resemble one of a One Direction concert; a.k.a. 95% fangirls and fanboys ranging from the teens through mid-20s, and 5% parents who gave their tweens a ride to the show. As soon as she walked out, the crowd literally erupted in an uproar of screaming/screeching girls, and for the first half of the show, the mosh levels were equivalent to an arena rock concert. Girls be getting feisty tryna get that perfect Instagram photo or just a closer glimpse of Marina doe! 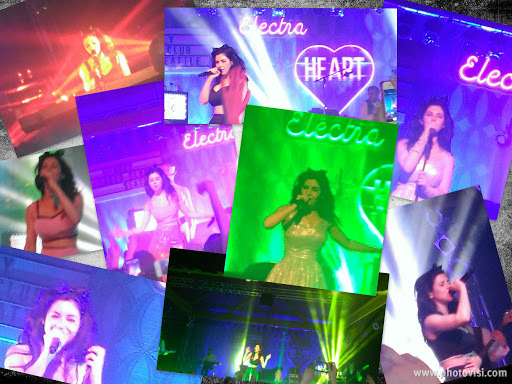 Marina commands the stage like no other. With at least four wardrobe changes (she has the best outfits), quirky stage props (i.e. mannequin outfitted in a baby blue tux, her fluffy stuffed animal poodle, soda & burger stage props), and a dapper band, she is the FIERCEST of fierce. And like the cutest, EVER, with her Bristish accent. Her voice is beautiful with strong lower register vocals that are reminiscent of Katy Perry’s, and her upper register will give you vibes of Florence Welch. M&TD graced the crowd with the best of the best tunes from her two albums (although all her tracks are solid) and everyone left the Showbox a happy camper. Marina brought along some new kids on the block, Little Daylight, to open for her and it was definitely a great choice. Little Daylight provided some great catchy electro-poprock tunes to pump up the Marina crowd, and if you’re fans of other bands like Shiny Toy Guns, The Naked & Famous, or Tegan & Sara, then you would totally love these guys (and gal)! That’s all for now, see y’all at the next show!